Upon seeing Donkey Kong Country: Tropical Freeze being revealed during in our live reaction video, I expressed hope that since we’re getting another DKC game, this means that many of the songs in the game will be remixes of the music in Diddy’s Kong Quest (like DKC and DKCR). Chief amongst these remixes would be Stickerbrush Symphony, the song many consider either the best song in DKC2, the best song in David Wise’s career, or the best videogame song of all time. 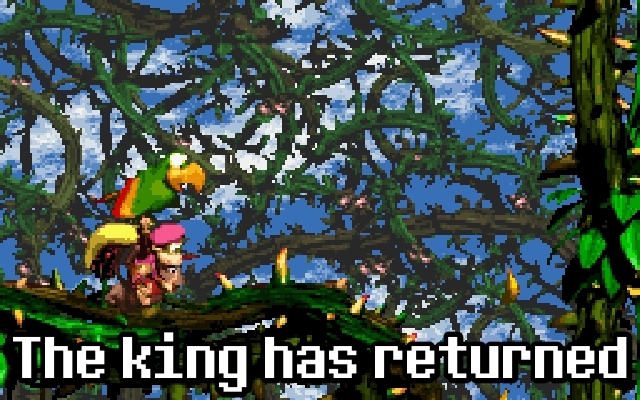 Kenji Yamamoto did an excellent job remixing much of Wise’s work in Donkey Kong Country Returns, so I was wondering how he’ll handle a song such as that. It looks like I’ll be getting my answer as David Wise will be teaming up with Yamamoto to compose for Tropical Freeze. We really haven’t heard much from Wise in the videogame scene. Last we heard of him, he was making remixes for fan albums at Overclocked ReMix. Any chance we get to talk about Wise on the podcast turns into one long trip down memory lane. To see Wise come back to the series that made him a household name amongst gamers is certainly a plus for this game. This entry was posted in E3 2013, Gaming News and tagged David Wise, diddy's kong quest, donkey kong, donkey kong country, donkey kong country 2, Donkey Kong Country Tropical Freeze, E3, E3 2013, Kenji Yamamoto, nintendo, Tropical Freeze, wii u on June 12, 2013 by Steven T..
Don’t forgot water (good enough) and ice levels plus dixie kong. Probably more animal buddies with rambi, would be cool to see squiter and Donkey Kong together.